(GDS MC, GDS MD, GDS BPM, GDS Packer, GDS Mailman), BPM, ABPM vacancies available in Odisha Postal Circle. Selection for this vacancies will be through 10th class marks only. An automatic merit list will be generated based on candidates Marks and Caste reservations. 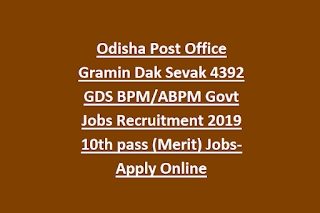 There is no exam or interview for this BPM/ABPM, GDS vacancies of Odisha Post Offices Recruitment 2019. Candidates who are interested they can submit their application online through the link of www.appost.in/gdsonline. Closing date for this BPM/ABPM, GDS vacancies online application is 15-03-2019. 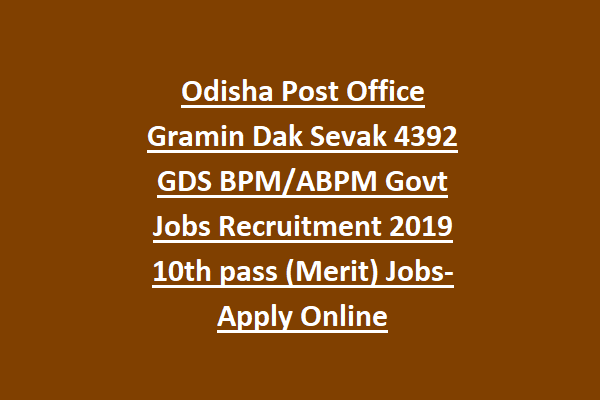 Complete details about Odisha State Post Offices Gramin Dak Sevak jobs recruitment details are given below. There are total 4392 GDS BPM, GDS ABPM and Dak Sevak vacancies available in Odisha Postal Circle Recruitment. Community wise GDS Posts are given below. Candidate must have qualified 10th class/Matriculation from a recognized board. Candidate must have computer knowledge certificate. For GDS posts age limits are 18-40 years, For OBC-18-43 Years and for SC/ST candidates age limits are 18-45 Years. For PH Candidates upper age limit is 50 Years. Selection for Odisha Post Offices GDS Recruitment will be based on candidates marks percentage in 10th or Matriculation. System will be generated a Merit list automatically while considering Reservations and 10th class marks. For male candidates of OBC/General application fee is Rs.100/- to be paid in any nearest e post offices. For others there is no fee. Interested candidates can submit their application form online through the Postal Department official website of www.Appost.in/gdsonline. Only online applications will be accepted. At the time of entering 10th class marks enter the original marks if any wrong entry will may lead to judicial. Please enter exact marks percentage only. You have to upload the documents of 10th memos or certificates, Computer knowledge Certificate, Caste Certificate if applicable and Signature and photo at the time of online application. Download notification here for Odisha State Postal Department Gramin Dak Sevak, Branch Post Master Jobs Recruitment.